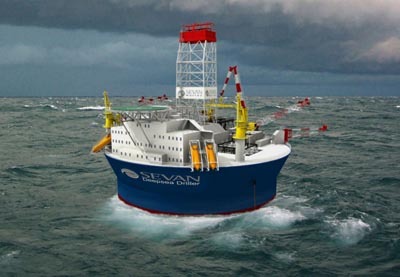 The world’s first ultra-deepwater “round rig”, the Sevan Driller, has been classed by Norway-based classification society DNV and is ready to drill in water 4.2 kilometres deep. The completed rig was “baptized” at COSCO Shipyard Croup’s Qidong Shipyard in Shanghai on 28 June 2009. The rig can drill wells 40,000 feet (13,500 metres) deep and can store 150,000 barrels of oil, making the driller “part floating storage”. The rig is due for delivery in third-quarter 2009, when Petrobras puts it to work in the pre-salt of the Santos Basin offshore Brazil, a major deepwater oil province.